Wow. The colors are vivid in the bright sun; the lawns are brilliant green; and the old trees and surrounding forest tower impressively, casting inviting shadows — pools of respite from the tropical sun. The eye was drawn everywhere at once as we approached the massive stelae standing under thatched roofs in the beautiful lawns of Quirigua Archaeological Park in central Guatemala. Nancy and I have joined a tour group from our Caribbean cruise (off Holland America Line’s vessel, the Ryndam) for a bus trip and tour of Quirigua. A bus trip of about two hours took us far into the central river valley of Guatemala. Our tour guide was outgoing, friendly, and spoke fluent, unaccented English. Throughout the ride he kept up a steady stream of fun and explanation, pointing out the details and the beauty of the massive fertile plain, then moving to discuss the history of US-Guatemalan international relations before settling into the history of Quirigua as we approached the park. 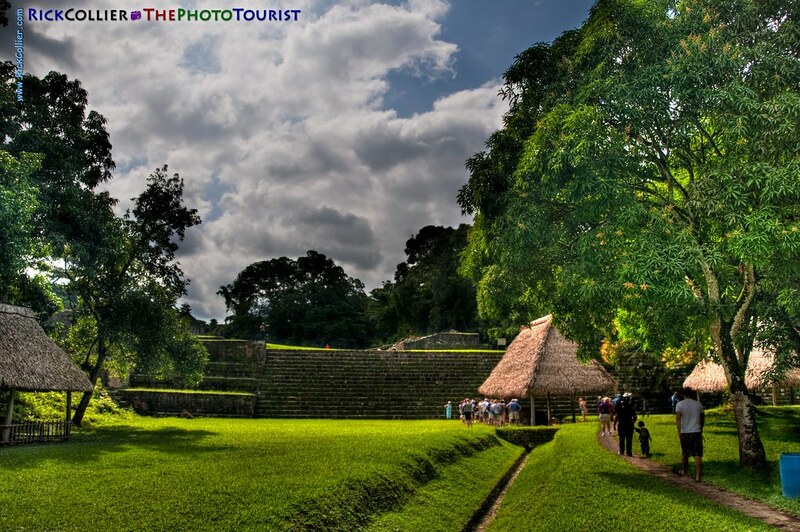 Quirigua is not considered a large or particularly impressive Mayan site. The park does have some impressive stairs leading up to a palace compound, but it lacks the massive pyramids and temples of better-known sites elsewhere in Central America. 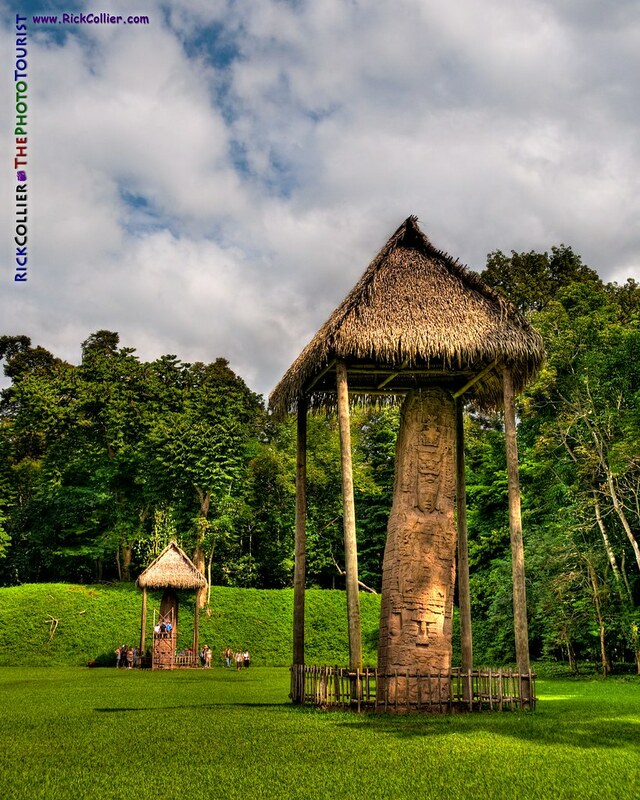 Still, Quirigua is a world heritage site and home of a significant collection of Mayan stelae and zoomorphs of the Mayan classic period. As soon as I started to shoot, I realized my Nikon D300 DSLR was not going to be able to capture the fantastic beauty that I was seeing. The day was too bright and the shadows too dark (and did I mention, inviting? ): I could choose to properly expose the bright sunny areas or the shadows, but not both. I played with the settings, changing f-stop, ISO, shutter speed, and filters: No luck. For all my purism, the camera simply could not handle the dynamic range alone to capture the incredible vibrancy and light that my eye so effortlessly enjoyed. Time to try something new: High Dynamic Range (HDR). I have long been a fan of real masters of the HDR craft. (For a great example check out Trey Ratcliff’s work at his web site, www.stuckincustoms.com.) Here at Quirigua it was worth a shot. HDR involves taking multiple exposures over a very wide exposure range and then later digitally combining them to best capture the vivid scene that the eye perceives but the camera cannot capture. I set the camera to automatic bracketing, nine shots covering the widest range it could handle. I forgot my tripod, so stability for my HDR attempts was challenging: I managed my breathing, adopted careful body positions to minimize vibration and body shake, and braced against solid objects or laid on the ground. My camera periodically ripped off bursts as we wandered through the park: snap-snap-snap-snap-snaaap-snaaaaaapp-snnaaaaaaappp-snaaaa-aaaappp-snaaaa-aa-aaaaaappp! My fellow travelers were curious and I did my best to explain: Smiles and curiosity led to shaking heads, nods, and skeptical head-shakes as people wandered away. This entry was posted on Tuesday, March 30th, 2010 at 23:57 PM. It is filed under Land & Air, thePhotoTourist and tagged with archaeology, Caribbean, classic, cruise, forest, garden, grass, Guatemala, HDR, high dynamic range, Holland America, Holland America Line, jungle, lawn, Maya, Mayan, not_uw, pole, post, Quirigua, Quirigua Archaeological Park, Quirigua Park, Ryndam, stairs, stelae, stele, steps, temple, thatch, tour, tourist, tourists, tree, trees, western Caribbean, zoomorph. You can follow any responses to this entry through the RSS 2.0 feed.